Portland, Maine- The Portland Sea Dogs have partnered with Goodwill Industries of Northern New England to host the 4th Annual Goodwill Night and Donation Drive at Hadlock Field on Wednesday, August 7th when the Sea Dogs take on the Richmond Flying Squirrels 7:00 PM. Fans are encouraged to bring bags of gently used clothing, books and other household items to Hadlock Field to donate to Goodwill. Goodwill will have a donation center at Hadlock Field to collect the items. For a list of acceptable donations, please visit Goodwill's website: http://www.goodwillnne.org/donate. Fans that make a donation can enter to win a $50.00 gift card to shop any of the 27 Goodwill stores located throughout Maine, New Hampshire, and Vermont. Donations help fund Goodwill programs that strengthen our local communities by getting people back to work and receiving the support they need to lead more stable lives. 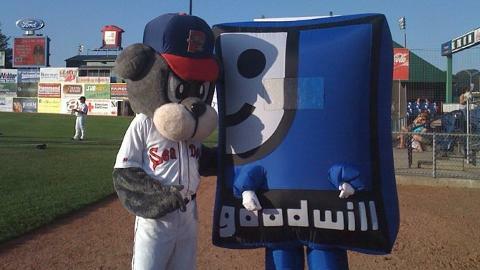 Puffy G, Goodwill's mascot, will be there to throw out the first pitch. Goodwill Industries of Northern New England provides community resources that eliminate barriers to opportunity and help people reach their fullest potential through the power of work. A social enterprise for over 100 years, Goodwill reflects economic, social and environmental sustainability, with a focus on connecting people to marketplace employment. Our services are funded by revenue from retail and recycling operations, grants, fees, and philanthropic gifts. Please visit www.goodwillnne.org for more information. Tickets are available for all remaining 2013 Sea Dogs' home games. Tickets can be purchased by contacting the Sea Dogs Ticket Office at 207-879-9500 or online at www.seadogs.com.